In this blog instead of ranting about something that I detest, I’m just going to share. This is a real conversation I had on LinkedIn recently after accepting a connection request that was sent with the generic pre-populated message. Seriously! Meet Brad, he sent me a connect request on Linkedin and I wasn’t 100% sure if we had met. So I sent him a message, and the following dreary conversation occurred. Hi Brad, Nice to meet you. What inspired you to connect with me and how can I be of help? Alice – Thanks for your note. Our Company is a software development firm. We cover the entire software development cycle from architecture to product launch. We have a laser focus on providing the high-end technical resources, in a customer centric environment. This allows you to get the project results that you desire, in a cooperative engagement environment. So I was hoping to get 20 to 30 mins on your calendar in this week or the coming one to discuss your existing or upcoming projects related to software development around web & mobile? Thanks, Tell me, what do you know about my company that makes you think it would be worth your time to get on the phone with me? Alice – The purpose is to see if there is any project related to custom IT software development surrounding web & mobile where you need some outside support. If yes, we would like to show you our core capabilities and give you a little presentation about how we are different and better than others. P.S. Note: My first message to you was all about you. Your message to me was all about you. You didn’t give me the answer to my question, you dove right into your pitch. Then when I asked you another question you didn’t answer it, you launched into your pitch. Alice – I’m sorry if I didn’t answer your questions directly. Let me answer your first question. What inspired me to connect you is your titles thought you’d be someone who might be interested in having our services now or in the future. What I know about your company is you help firms exceed their lead generation. My purpose of reaching you out again is to check if you have any need surrounding the areas I have mentioned above. At 3:04 PM – REMOVE! This is not selling. This is annoying. Are you or your sales people annoying people on LinkedIn? If you are not 100% sure about how your sales team is using LinkedIn, find out now. Ask them to show you what they are doing. If you want to be sure your team is using LinkedIn productively, call me (775)852-5020. I will get you the resources you need. Way to go Alice! You are exactly right on with your response! That guy had no interest or had not done any research on your company! Always love to meet another Alice. I hope you sent me a connection request. I didn’t want to call him out, but it was such a good example of awful sales behavior. What feels bad about it, I don’t believe it is his fault. Someone taught him to do that. He probably has tremendous pressure on him to make quota and little to no training. For him, it is only a numbers game. If he sends enough messages and calls enough people he will get some minimal response and some of it will turn into sales. Very sad. Just Say “NO” and unfriend. Right! And typically I do. I am careful though because people all over the world hear my podcasts, webinars and read my posts and I genuinely do want to be connected to those who care and want to learn. I am happy to be a resource. So, I have to ask and when they come back with a spamy sales pitch, I usually just disconnect. I wanted to see if this guy would change his course. As you can see, he didn’t. From his pitch, i’m really not sure what he could do for anyone. His laser focus didn’t focus on learning about your company and you. You are right. Even from his pitch I couldn’t figure out what he was offering and he certainly didn’t care about what I needed. He could have saved some time by just asking if I was in the market for xyz and when I said no, thanked me and moved on. Great Article Alice! Connection requests like this are more than annoying. I won’t describe what they really are since it isn’t socially correct in a LinkedIn comment! Thanks, Barbara. It’s crazy. I get cold calls (they go to my voicemail) and cold emails that are similar to this. It’s hard to believe that sellers get a response to this type of thing, but they must or they wouldn’t keep doing it. Imagine if someone trained them to at least act like they cared about the prospect and find out if there was a need before pitching. They could save themselves a lot of time and the rest of us a lot of aggrivation! The name Archer was a tipoff – he, like others that have little training – will always miss their target. Shoot shoot shoot aim isn’t working. He definitely missed his target!! @alice, thank you for sharing!!! I get so many of these “invitations” that I have resorted to a more direct rejection of them. When someone I don’t know or remember invites me, invariably with the impersonal default, I click through to their profile to see if I remember them. Most of the time, I see a fake profile or a “sales” person. I report the former as spam. If the latter, I tell LinkedIn that “I don’t know [invitername],” so LinkedIn will restrict them if other people do the same. My goal is to give the platform and community the right and truthful signal. Sometimes, even when I don’t know the person, I accept the invitation and always ask them what prompted them to connect with me. Depending on their response, I may disconnect afterward. As you say, it’s amazing that firms are paying people to do this; I’m imagining that their results are so poor elsewhere that even tactics like you describe work better for them—or they have no other ideas. I see LinkedIn as a common (i.e. the “tragedy of the common”), so it’s in everyone’s interest to protect it against this type of thing. Thanks again for calling it out!!! Chris, it’s so crazy to me that there are salespeople doing this and it’s amazing that so many people don’t know how to send a custom connection request http://aliceheiman.com/dont-click-to-connect/. That said, LinkedIn doesn’t help us. The platform allows you to send a connection request without a custom message and from most sections of LinkedIn when you click connect it doesn’t even give you the opportunity to send a custom request. The other thing that is so bad is that people don’t know how to mouse over the comment icon on the requests to see if you sent them a connection request. I recently had a very bad experience trying to connect to people who I would be running training for. I like to reach out in advance and introduce myself on LinkedIn. I sent custom requests to everyone. I found out at the training that several of them rejected my request and said they didn’t know me. They were amazed when I showed them how to see the message I had sent them. Because so many of them rejected my request I now get this message ‘Please note: This message is a notice that you are nearing the threshold of “I don’t know” responses you can receive before you will be required to enter an email address when sending invitations. Please remember to only invite people you know.’ I feel LinkedIn could do a much better job to turn this situation around by requiring a custom message and making it easier to see the message once you send it. OUCH! Alice lays the social media smackdown on a solicitous spammer AND teaches her students a valuable lesson to help us succeed in sales and life. This blog post not only made my night…but my life. Thanks, Jim. I hate to call people out in public but this was such a great example of what not to do, that I couldn’t resist. Bad selling needs to stop. There is so much good information, that is free, on how to sell. It’s embarassing to see bad selling like this. When the only tool in your toolbox is a hammer – Every problem is a nail. It’s too bad no one taught him the proper way to approach someone he doesn’t know. They could be getting great results if they used a variety of methods to share great information and allow people to get to know them. It’s scary that people don’t know how to interact. 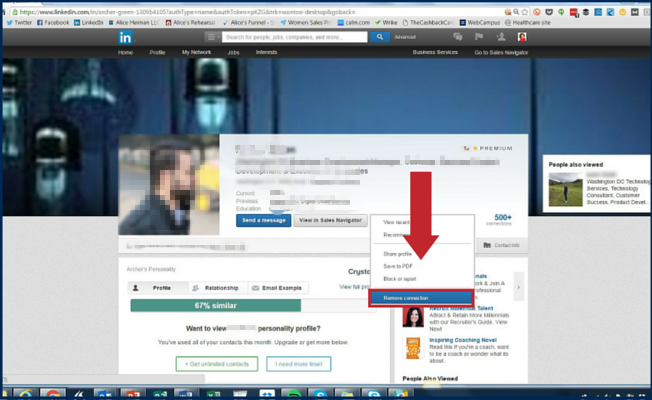 No buy buttons on LinkedIn, so you cannot be selling can you? You noticed! Ha, ha. That’s a good one. Some people are always closing. I’ll say! Pitching without asking questions is so old school. Hard to believe anyone still does that. Closing is the natural progression when the buyer has interest. No way to force it. Such bad selling. “Social Spamming” is what it should be called. Imagine something very personal and relevant, this is the opposite. You are so right, Dean. It is social spamming. Cold calling, cold emailing, cold LinkedIn emailing is spamming and such a waste of time. It’s ok to contact people you don’t know but do it with some style. Warm it up by doing some research and if possible get an introduction. If you can’t get an introduction then figure out something you have in common or some information you have that’s valuble and approach with the idea of giving and learning. Send a connection request that shows the person why you want to connect and what you have to offer. Then build the relationship before selling. Thank you for that information, it’s extremely valuable to navigate the waters of LinkedIn. I read every article you publish here. Having said that, I am in sales in a new industry and really do not want to come off as a pest to someone I don’t know. How would you suggest reaching out to potential contacts to identify the specific person who might be interested in my companies services whether it be for “right now” or in the future? Is there a way to politely inquire without being seen as a pest? Thanks so much, your advice is greatly appreciated. It is ashame that LinkedIn doesn’t seem to care about the quality of the connections. They keep removing and changing features. You probably know that they just changed the messaging so that you can’t reply before accepting. That was my saving grace. Now we have to ignore or accept and then if they are innappropriate, dis-connect. In a way it is easier because I don’t have to mouse over each bubble to see if they wrote a personal note. Ever changing. It’s so easy to dial into people by looking at their LI profiles and tweet streams; there’s no excuse for “cold” any more. Even recruiters! I constantly ask them if they’ve looked at my profile when they proposition for for something way off base. To me, this behavior communicates lack of care, professionalism, or sloppiness. Ignorance. Absolutely, no excuse. I agree. I believe the tremendous pressure put on salespeople by their quotas and their sales management drives this behavior. That and lack of training. However, smart salespeople figure this out on their own. Cold contacts are ineffective when they are self centered. They are tough anyway but the only chance you have on a cold contact is doing your homework, finding common ground and approaching with respect and offering something of value. Great post! I currently have 39 requests to connect that I haven’t responded to due to being burned one too many times by these super sales people launching into the pitch as soon as I hit the accept button. If I see “sales,” “business development” or “account executive” in their titles I am ignoring them at this point. This is for those I never met, mind you. And some get downright aggressive – one stalked me on my personal Twitter account and attempted to call the main office of my company several times insisting that we had an appointment. These bozos ruin it for all of the legitimate, hardworking salespeople out there who really do have something of value to show me. Keep calling them out so hopefully they will recognize and regroup. @Lynne thanks for sharing your technique ;~j. Reading between the lines, I’m guessing that “sales”people have damaged your trust by wasting your time. I’m the same with phone calls. For the past few years, I have lamented the sales/marketing trend of “rediscovering” the phone for cold calling. I never answer the phone unless the person is in my phone list. I’ve never been disappointed. In my work in experiential social media, I’ve learned to develop trust at scale, and it all starts with asking people questions. No words have the credibility of relevant questions, so anyone starting a conversation should start with relevant questions. Since almost anyone worth approaching has a LinkedIn profile, often Twitter, and always a website, there’s only one excuse for lack of relevant questions: laziness and lack of consideration. When salespeople ask me questions whose answers are all over my presences, I know they don’t care about me and/or have poor work habits. They are free to waste their own time, but why waste mine? Unfortunately, @Alice’s efforts notwithstanding, I encounter very few exceptions. Words are tools which too many people use to mislead because it’s easy and cheap. Websites, content marketing, sales scripts all SAY they are interested in [you], but they talk about themselves. Having run marketing, I know how seductive “scale” is to executives; it’s arguably THE lesson from the Industrial Economy, which is in its twilight now. Having informed, considerate and valuable conversations is less scalable than hooking up content marketing BUT there is scale when one does it in digital social public. I think we’re witnessing the last gasp of these inconsiderate sales practices, but I’m afraid it will get worse before it gets better. I predict analogous apps for phone and snail mail. Content marketers, salespeople, and others should stop and think while they still can. I reject requests to connect with biz development “professionals” and those who claim to help coaches get more business and hit the “I don’t know this person” button. I agree with Alice that it’s annoying that LinkedIn keeps changing how it works. I preferred it when one could have a mini correspondence before accepting or rejecting a link request. I wonder how many bugs there will be with Microsoft-LinkedIn. Barbara, I agree. Reject. I can’t tell you how many spammy messages I get about helping my business. They don’t even take a minute to read my profile and figure out what I do. You can still have correspondence prior to accepting. Use the little arrow in the top right of the box that is the request. That lets you send them a message before connecting. LinkedIn said they were removing this, but I notice it is still there. If there is a little comment bubble that means they sent you a customized message. Otherwise the arrow is there. I’m a realtor but I don’t really use linked in for sales. I’ve concentrated on Facebook and Twitter for that. I just had a friend contact me on linked in to talk about a house. I need to learn these rules. I don’t prospect on linked in because for some reason I just don’t feel that comfortable with it. Templates for openers, fair enough; for second emails, I get it, but at least personalize — and then review; for a third, direct email, if you know you needed templates for emails 1 & 2, get someone to read the one you’ve actually/finally written yourself, if only so as not to waste the opportunity of a lead (a person) writing to you (giving you the time of day) *twice* beforehand. They may even let you know if you’re failing to answer the lead’s question(s), too ? @Alice The use of LinkedIn has spiraled out of control. LinkedIn is using the service as it intended — SELL its services to a highly influenced marketplace, saturate it content marketing and advertising. In the past, phase one — people would connect to build their network. Phase two turned into seeing how many people you could connect with — thousands! Phase three @Christopher — refuse 80% of the connected requests. Yes, refuse! I have hundreds of people still waiting to connect. I don’t know these people. If I get a personalized invitation, I might connect, only after, I looked them up. Allow me to elaborate on the topic of connecting. I had an interview with a technology company. During my interview, I was asked “why did I not build credibility by mentioning a name or two that we were both connected through?”. Great question. My response: I asked him how many connections did he have? He said, “1200”. I asked him, “how many did he personally know? How many would he make a formal introduction too? His response, “maybe 2%”. So I asked him, “if I through out 3 names, do you think you would have known these people on a personal basis to call them and asked them if they would provide a recommendation in my behalf, would you be able to do that? And by the way, I looked. We were connected with over 300 people. Can you locate a key decision maker? Yes. Can you ask the proper questions in a professional manor to elicit a desired response? Yes. Can you show that you have researched the company, vertical, and provided significant value to other businesses in the same industry? Yes. To setup a drip campaign with Call-To-Actions and auto responses……….that is poor judgement, especially if a Key Decision maker responded to your email — you just blew that lead and lost credibility. Today, you have to build your own brand. As @Christopher mentioned, if you have any credibility, you must have a LinkedIn profile, Twitter account, personal website, and possibly a business Facebook account. I am not a proponent of sharing or inviting anyone to connect on my personal Facebook account. If you are considered a subject matter expert or a blogger related to your field, your chances are greater of reducing the number of touches before a prospect returns your call. By the way, I am a consultant and sales contributor. I dislike sales people sending me SPAM through LinkedIn. I wish this would stop! And please don’t hesitate to send me a connection request on LinkedIn, letting me know we were conversing on the blog.